The end user, who owns and uses communications systems, often finds it hard to get information about fiber optics aimed specifically at them. Industry standards are written by and for manufacturers. Most training material is written to train installation techs, the group the FOA focuses on with its certification programs. So the FOA has created a special section of our website where end users can find answers to their questions on fiber optics or even find out what questions to ask. We think you will find this interesting and useful. We welcome your questions and feedback. 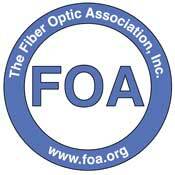 The FOA has several options to help you get started in fiber optics. These are the way to get started. Should you use fiber optics for your communications system? Isn't fiber optics still too new for everybody to adopt it? Is it hard to design and install fiber optic networks? This short guide is designed to help answer those questions for users pondering the choices and/or planning an installation and provide links to more in-depth information. You can download a PDF version of this page to print for reference. 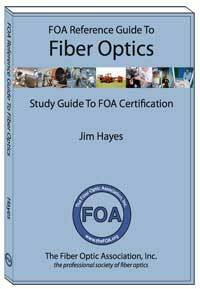 This guide covers all applications of fiber optics. If your applications are primarily premises cabling, the FOA has a section of its Online Reference Guide that focuses on fiber, copper and wireless for premises applications. and another focusing on outside plant fiber optics. One often sees articles written about fiber optic communications networks that implies that fiber optics is "new." That is hardly the case. The first fiber optic link was installed in Chicago in 1976. By 1980, commercial long distance links were in use and fiber optic data links for RS-232 were available. Since that beginning, fiber has become very commonplace - one should say dominant - in the communications infrastructure. If you make a long distance call today, you are undoubtedly talking on fiber optics, since it has replaced over 90% of all the voice circuits for long distance communications. Most large office buildings have fiber in the building itself. Only the last link to the home, office and phone are not fiber and installations of fiber to the home are growing rapidly. CATV also has discovered fiber optics, along with compressed digital video. Most large city CATV systems have been converted to fiber optic backbones which allow voice and data transmission in addition to video. The LAN backbone also has become predominately fiber-based. The back-end of mainframes and storage area networks (SANs) are almost totally fiber. Only the desktop is a holdout, currently a battlefield between the copper and fiber contingents. Fiber optics offers an unrivaled level of security. It cannot be easily jammed or tapped and is immune to interference. It is widely used for security cameras, perimeter alarms and other critical systems in military, government, utility and civilian applications. Fiber optics really is the medium of choice for long distance, high bandwidth or secure communications. Lets look at why it is, how to evaluate the economics of copper versus fiber and how to design fiber networks with the best availability of options for upgradeability in the future. Fiber optics has become widely used in telecommunications because of its enormous bandwidth and distance advantages over copper wires. Commercial systems today carry more phone conversations over a pair of fibers than could be carried over thousands of copper pairs and can be run hundreds of kilometers between all-optical repeaters. Material costs, installation and splicing labor and reliability are all in fiber's favor, not to mention space considerations. In CATV, fiber pays for itself in enhanced reliability and the ability to offer enhanced services. The enormous number of repeaters used in a broadcast cable network are a big source of failure. CATV systems' tree and branch architecture means and upstream failure causes failure for all downstream users. Reliability is a big issue, since viewers are a vocal lot if programming is interrupted! The ability to offer Internet access has created significant revenue streams for CATV operators also. For LAN and other datacom applications, the economics are less clear today. For low bit rate applications over short distances, copper wire is often a better choice. As distances go over 50 to 100 meters and speeds above 1 Gb/s, fiber begins to look more attractive. Not only does fiber have more bandwidth capability, but very high speed copper links use 4-8 times more power than fiber and have latency problems. Upgradeability usually tilts the decision to fiber, as one optical fiber has already outlived a half-dozen generations of copper wiring. Installing laser-optimized fiber today will provide a long useful life to any cable plant. Some applications demand fiber. Factory floors are messy electrical environments where optical fiber, both glass and plastic, are used everywhere to provide reliable communications. Long CCTV links in security systems are now almost exclusively fiber. Even millions of cars use fiber (POF) for safety and entertainment/communications systems. If reliable communications are a must, fiber is usually the best choice. Fiber's advantages over copper result from the physics of transmitting with photons instead of electrons. In glass, optical attenuation is much less than the attenuation of electrical signals in copper and much less dependent on signal frequency. We all know that fiber optic transmission neither radiates RFI nor is susceptible to interference, making it the only choice for secure communications. Unlike copper wires that radiate signals capable of interfering with other electronic equipment, fiber is totally benign. Utility companies even run power lines with fibers imbedded in the wires for both communications and network management! Read more on fiber vs copper generally and in LANs. Fiber or Copper? A general overview and a specific look at fiber in LANs. Fiber optic links are the communications pathways between devices. A link is bidirectional, usually with signals transmitted in two directions on two different fibers. Using two fibers is usually the cheapest way, since the optical fiber itself is now about as cheap as kite string and fishing line! (FTTx PON systems use one fiber in two directions so it can use one PON coupler transmitting and receiving for lower system cost.) The link connects electronic signals from two devices that need to communicate, just like a copper cable. The link has a transmitter that converts electronic signals from communications equipment to optics and a receiver that converts the signal back to electronics at the other end. Fiber optic transmitters use LEDs or semiconductor lasers to convert electronic signals to optical signals. LEDs, similar to those used everywhere for indicators, except transmitting in the infrared region beyond human perception are used for slower links, up to about 100 million bits per second (Mb/s), for example fast Ethernet LANs. Faster links use infrared semiconductor lasers because they have more bandwidth, up to tens of billions of bits per second (Gb/s). Lasers have more power, so they can also go longer lengths, as in outside plant applications such as long distance telecom or CATV. As noted, transmitters use infrared light. Infrared light has lower loss in the fiber, allowing longer cable runs. Typically multimode glass fibers use light at 850 nm, referred to as "short wavelength" and singlemode fiber operates at 1310, 1470 or 1550 nm, called "long wavelength." Since the light being transmitted through the optical fiber is beyond the range of human sight, you cannot look at the end of a fiber and tell if light is present. In fact, since some links carry high power, looking at the end of the fiber, especially with a microscope which concentrates all the light into the eye, can be dangerous. Before examining a fiber visually, always check with a power meter to insure no light is present unless you know the far end of the fiber is disconnected and use a microscope equipped with a laser filter. At the receiver end, a photodiode converts light into electrical current. Photodiodes must be matched to the transmitter type, wavelength, power level and bit rate as well as the fiber size to optimize performance. It's the receiver that ultimately determines the performance of the link, as it needs adequate power to receive data reliably. Receivers have a certain amount of internal noise which can interfere with reception if the signal is low, so the power of the optical signal at the receiver must be at a minimal level. The power at the receiver is determined by the amount of light coupled into the fiber by the transmitter diminished by the loss in the fiber optic cable plant. The installer will test the cable plant for loss after construction, comparing it to a loss calculated from typical component values called the "loss budget." Transmitter power can be measured when the networking equipment is installed using a patchcord attached to the transmitter. Networks adapt the generic fiber optic link described above to a specific network's needs. An Ethernet link will be optimized for the bitrate and protocol of the version of Ethernet to be used, for example Gigabit Ethernet. Video links may be analog or digital, depending on the camera, and may include camera controls in one direction and video in the other. Industrial links may be based on RS-232 or RS-422 protocols. Most computer or telecommunications networks have adopted standards for fiber optic transmission as well as copper wiring and wireless. 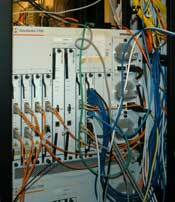 However, sometimes the user has equipment with copper interfaces but wants to use fiber. Then they can use fiber optic media converters, which do exactly what their name suggests. Media converters will convert from one media to another, typically UTP copper to optical fiber, coax to optical fiber or multimode to singlemode fiber. Media converters are like transmitters and receivers in that they must be specified for specific network applications to insure the proper operation in that application. Since so many link types exist, it is impossible to generalize on fiber optic link characteristics, but there is a table in the FOA website detailing most standard networks. When designing or installing fiber optic cabling, the contractor can either design to cabling standards, which allows use with any network or communications system designed for those standards, or for a specific network, which may allow optimizing the cable plant. If the actual network to use the fiber optic cabling is not known, the best plan is to design, install and the test cable plant based on standardized fiber optic component specifications rather than any specific network needs. Today, we're seeing premises cabling, designed to carry gigabit and 10 gigabit traffic with 850 nm VCSEL transmitters, moving toward standardization on 50/125 laser-optimized fiber (now universally called OM3 or OM4 for the two grades of available standardized fiber) with LC connectors to match the manufcturers' standard for VCSEL transceivers. OM3 cabling even has it's own color, aqua, specified in TIA-598. If you are planning, designing, installing or using high speed premises fiber optic networks, it appears you should be recommending and using OM3 or OM4 fiber and LC connectors. Within the industry, this is becoming a "de facto" standard known as "OM3 or OM4 cabling." One big advantage of using a full OM3 or OM4 cabling standard is that it is easily identifiable by the aqua color and cannot be interconnected with legacy cabling. The FOA is encouraging all FOA-Approved schools to adopt the OM3 or OM4 nomenclature in their training. We've added this recommendation to the FOA User's Page and will add it to the NECA/FOA 301 standard when revised. The fiber optic cable plant will be type OM3 (or OM4) cabling, using laser optimized (OM3 or OM4) fiber in a cable with aqua colored jacket, terminated with LC type connectors and mating adapters all colored acqua. Individual fiber cable runs will be specified by number of fibers and cable type (riser, plenum, indoor-outdoor, etc.) required by the actual installation. Here is a full explanation of OM3/OM4 nomenclature. Note that these documents refer to other more detailed documents such as TIA or ISO standards. While this document is primarily focused on the design, installation and maintenance of fiber optic cable plants, most end users will be interested in costs, so the FOA has a separate document on estimation. 3.1.1. Select a communications module or converter that fits the data format you plan to transmit. The first step is to choose the type of system needed. Fiber optic communications products exist for almost every type of communications system, from high speed telephone and CATV systems to simple low speed RS-232 or relay closure links. Many are media converters from standard electrical interfaces like Ethernet that have various options on data rates. Some are proprietary links for specialty equipment used for utility monitoring, industrial control, video surveillance, etc. 3.1.2. Select a fiber optic product that is specified to work over the range of your application. Note the type of fiber and other components such as connectors required for this product. a. Consider the range of the link as that affects the type of fiber and transceivers needed. b. Short links use multimode fiber and LED sources, while longer links use lasers and singlemode fibers. 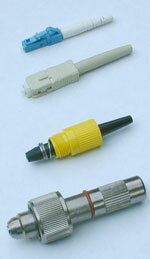 c. Most fiber optic communications products offer several versions that cover different ranges. d. Alternately, if you already have fiber optic cable plant installed, select a product that will operate over your fiber optic cable plant, considering both fiber type and distance. a. Determine the working environment of the fiber optic cable plant. Some applications are in office environments, some on factory floors, above ceilings and some are outdoors. b. Outdoors, some cables are installed aerially, either lashed to a messenger or self-supporting, some are buried directly or in conduit and some must run under water. c. All outdoor cables require protection from water entry and any other environmental factors particular to the installation. d. Each application puts requirements on the cable design that should be discussed with cable manufacturers who can recommend cable types appropriate for that application. e. Not all manufacturers make the same type of cable, so talking to several vendors may provide options in cables that affect price or performance. g. Often singlemode fibers are added to multimode cables (called a hybrid cable) in case future networks need higher bandwidth. h. At this stage, also decide on the installation hardware needed, such as conduit or innerduct for buried cables and hangers or lashing for aerial cables. a. Long lengths of cables may need to be spliced, as fiber optic cable is rarely made in lengths longer than several kilometers due to weight and pulling friction considerations. b. If fibers need splicing, determine how to splice the fibers (fusion or mechanical) and what kind of hardware like splice closures are appropriate for the application. a. Cables will need terminations to interface with the communications products. b. Connectors need to be chosen appropriately or patchcords with one end terminated with connectors compatible with the communications products will be needed. c. Fiber optic connectors have several termination methods, some using adhesives and polishing, some using splicing, which have tradeoffs in performance. d. Discuss connectors with both manufacturers and installers before making this choice. a. Calculate the power/loss budget for the link. c. Compare it to the link margin for the communications products you have chosen. d. Discuss potential margin problems with communications equipment vendors. a. Using the design developed in this process, install the cable plant. b. Some users learn to install and maintain the fiber optic cable plant themselves, while others use contractors. c. Installers or contractors should be trained and experienced in the installation type being done, have references for previous work and be certified by independent organizations like The Fiber Optic Association. d. Follow the guidelines in the NECA 301-2004 Standard For Installing and Testing Fiber Optic Cables, available from The National Electrical Contractors Association. e. Do not discard excess cable from the installation, but store it for future needs in restoration if the cable plant is damaged. a. Test the cable plant for optical loss according to industry standards. Most cable plants are tested according to standards TIA/EIA-526-14 for multimode fibers and TIA/EIA-526-7 for singlemode fibers using Method B, with a one cable reference for 0dB loss. Calculate the approximate loss expected before you begin testing. b. Longer cables with splices should also be tested with an OTDR to verify splice quality. c. Cables installed aerially or in areas of likely stress can also be tested with the OTDR to verify installation quality. d. Troubleshoot any fibers that are high loss and correct the problem. a. After the cable plant is tested and known good, install the fiber optic communications equipment and test its operation. b. Use any self-testing options to check operation, use BERT (bit-error rate test) equipment or transmit known data and look for errors. c. Once a network is operating properly, it should require no maintenance ­ in fact, attempted maintenance on premises systems by un-qualified personnel is often a cause of damage ­ so it is best to lock fiber optic component enclosures to reduce unauthorized entry - a requirement for class 4 (high power)lasers. d. Outside plant networks may need frequent visual inspection just to find damage or potential damage. a. Perhaps the most important part of any installation is the final documentation. b. Accurate and complete documentation is invaluable in upgrading, troubleshooting or restoring a network. (Download the FOA Tech Bulleting "Fiber Optic Restoration" PDF, 90 kB) Documentation should include identification of all components, the paths of each cable, types of cable (and where the excess is stored for restoration), cable section lengths, locations of splices or terminations and the optical loss of each fiber measured at installation. c. If OTDR traces are taken, those should be stored with the documentation. d. Copies of all documentation should be kept at each end of the link and backups stored in a safe place. Documentation begins with a good blueprint. Fiber optics offers major advantages for communications systems including security, distance and bandwidth. Proper application of fiber optic technology will lead to highly reliable systems. That means the user must install an appropriate cable plant and test every component, all following appropriate industry standards. This guide is designed to provide to those directly involved in planning and installing the fiber optic network the information necessary to ensure proper installation and usage of fiber optic systems. Every project needs "paperwork" to define the project for both the user and the contractor. See the FOA page on Paperwork for a rundown of the important documents and what they mean. This list only concerns itself with the project steps unique to fiber optic systems, but many OSP applications require obtaining permits, easements or rights-of-way. That is beyond the scope of this document! c. Determine hardware requirements: connectors, splices, patch panels, closures, etc. 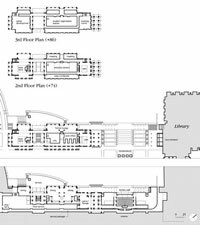 h. Don't try to build a marginal design ­ allow for "Murphy's Law"
4.2. Work with vendors on component specs to get best quality and price. a. Vendors usually have suggestions on components like cables or hardware that can facilitate design and implementation, but always get several opinions and compare their suggestions to what you understand you need . e. Once you have a design and component pricing, you can do a complete project cost estimate. 4.3. Have all components available before beginning installation so crews may complete the installation promptly and properly. 4.4. Use only trained, qualified installers, preferably FOA-certified. d. Review the design with the installer to familiarize them with the job and see if they have advice on how to make it easier or better but use your judgement regarding any changes suggested. b. Ensure that you have copies of the documentation regarding your contractors bonding, insurance, workers compensation, OSHA certificates etc. c. Long lengths (>200m) can be tested by an experienced technician with an OTDR after installation but before splicing or termination if there is any question about potential damage during installation. Remember OTDR testing is optional, but every link requires insertion loss testing with a meter and source. i. All fiber optic cables should be color-coded by jacket colors and/or marked with orange or yellow tags or whatever color is designated for your cable plant to identify it as fiber optic cable. j. Carefully mark all cables and connections for identification in a manner consistent with the company documentation processes. k. Dust caps from the connectors and couplings terminated in the enclosure belong to that enclosure and should be put in a small plastic bag and taped inside the cabinet for future use. 4.8. Install the communications systems. b. If patchcords are used for connecting optical ports to the cable plant, use tested patchcords that are known to be in good condition. Patchcords must match the fiber in the cable plant being tested to prevent excess loss. c. Copies of the documentation should be kept at each end of the link and backups stored in a safe place. 4.10. Fiber optic premises networks generally do not require periodic maintenance. a. As long as the network is communicating as expected, no maintenance should be required and the network should not be touched unless communications equipment is moved, added or changed. d. Outdoor installations, being more prone to mechanical and environmental damage should be visually inspected for damage as part of a regularly scheduled preventative maintenance program. Provide copies for your managers employees, contractors, installers, etc. And give us your feedback. Contact the FOA. If you are planning a fiber optic communications system, we'll send you a free copy of the NECA-301 Standard For Installing And Testing Fiber Optic Cables. Note: This information is provided by The Fiber Optic Association, Inc. as a benefit to those interested in designing, manufacturing, selling, installing or using fiber optic communications systems or networks. It is intended to be used as a overview and guideline and in no way should be considered to be complete or comprehensive. These guidelines are strictly the opinion of the FOA and the reader is expected to use them as a basis for creating their own documentation, specifications, etc. The FOA assumes no liability for their use. (C)2007-19, The Fiber Optic Association, Inc.